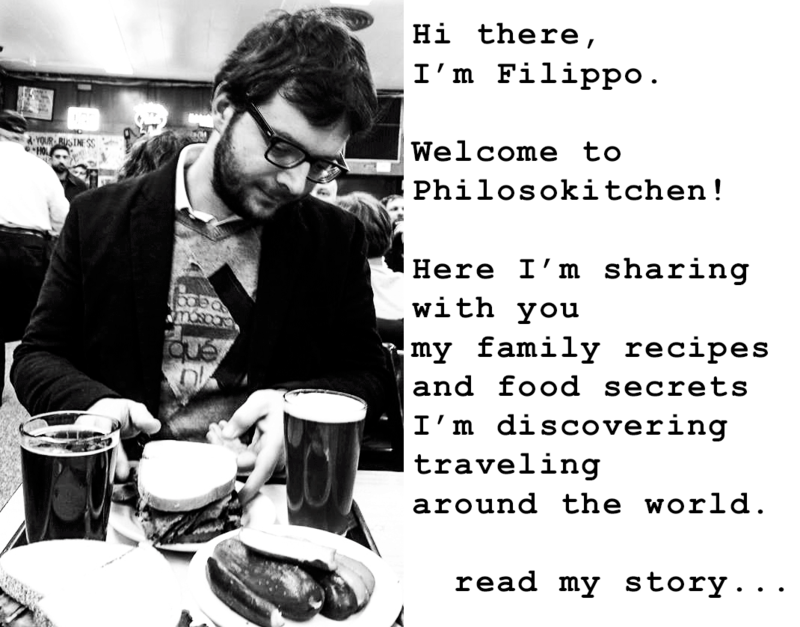 In Italy rice is a serious matter. 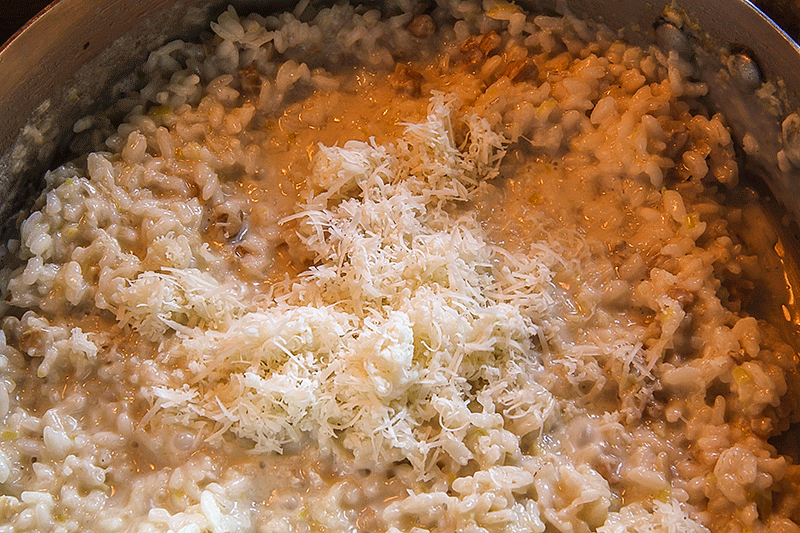 In the regions between Milan and Venice, was born one of the most classic Italian dishes, the” risotto”. The rice is cooked slowly into vegetable or meat broth, then mixed with butter, cheese and other ingredients, depending on the recipe. 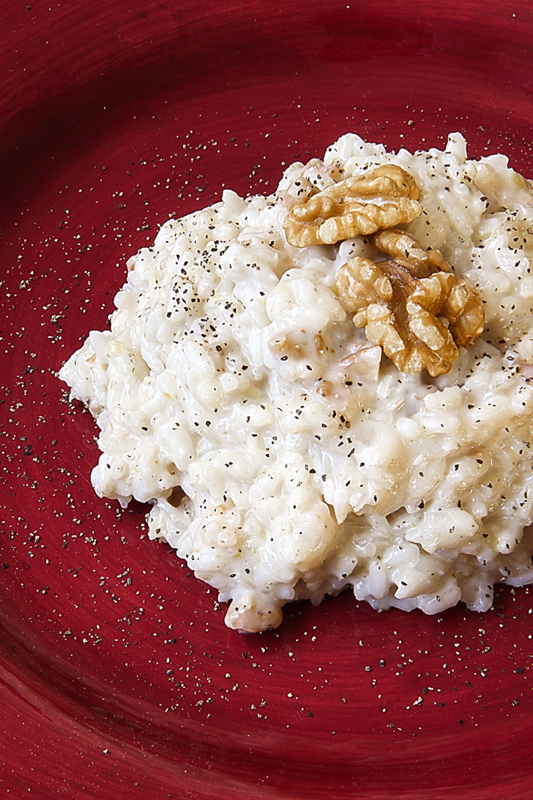 Today I recommend you a “risotto”cooked into milk, with Provolone cheese and walnuts. It is one of my favorite rice recipes and perhaps the first risotto that I remember to have eaten! 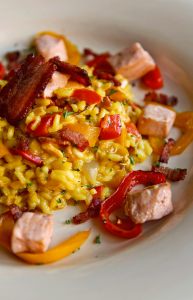 Pay attention about the compactness of the rice when the “risotto” is ready , which must be creamy without being watery. 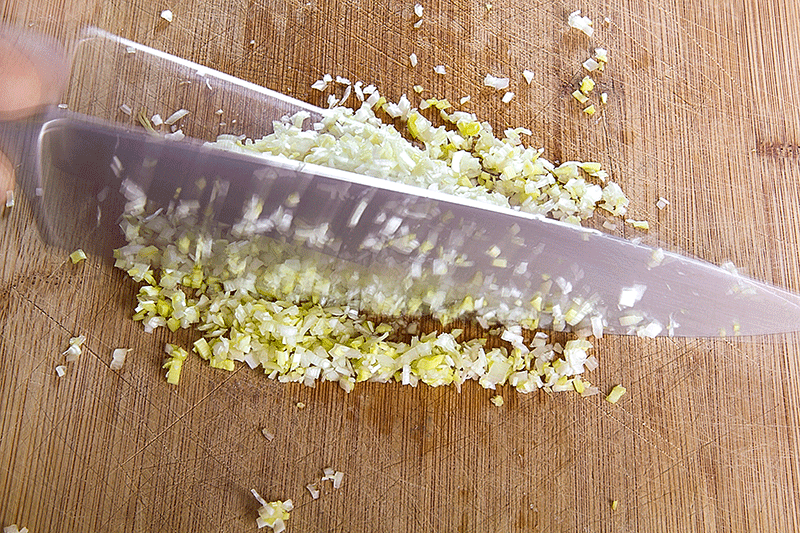 First, finely chop the white part of the leek. Now, heat the vegetable broth in a saucepan until it simmer, then keep the temperature constant by adjusting the fire. Preheat a large pot about 7-8 centimeters high, then add the butter very cold and let it melt. When the butter is melted, add the chopped leek and let it saute until it is soft and translucent. Now, add the rice and toast it for a few minutes into the butter and chopped leek, until it will create a semi-transparent film that will prevent from flaking. During this phase, set the flame and stir frequently with a wooden spoon to avoid any burning. 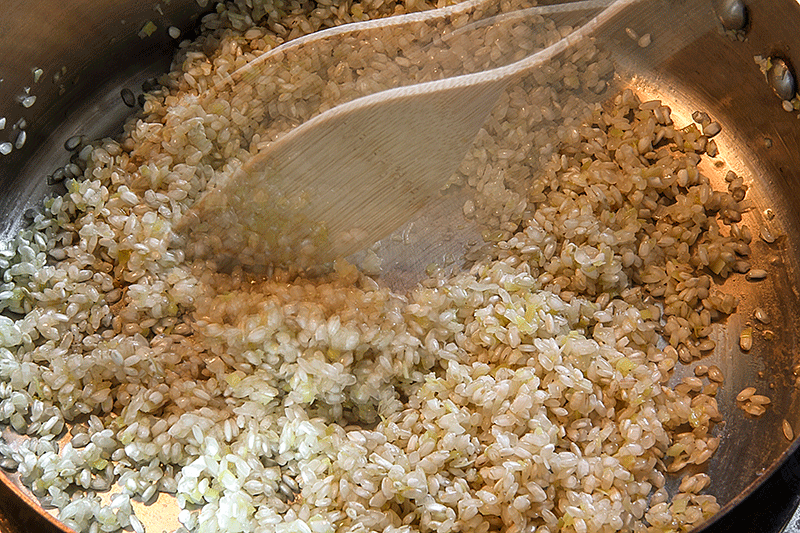 After toasting, add the hot vegetable stock to cover the rice a finger over the surface. Continue to cook setting the flame by slightly simmering the liquid without ever bubble too. 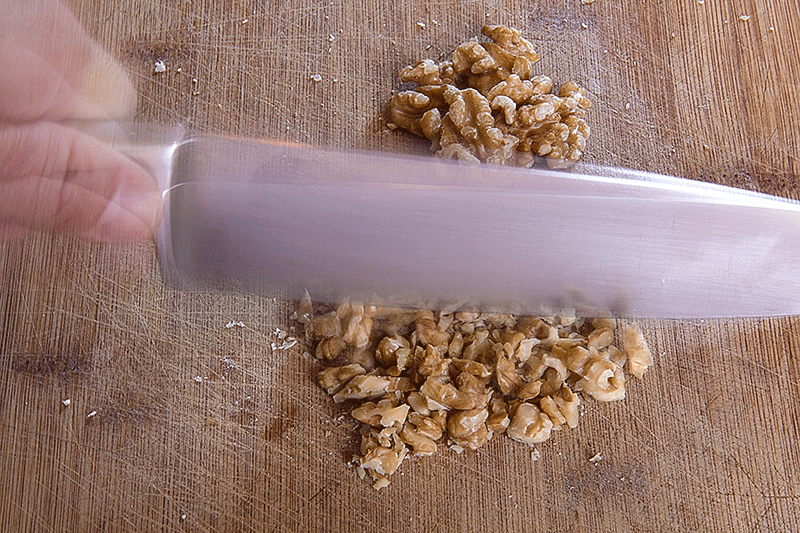 While the rice simmers, chop the walnuts with a knife, until obtain pieces small, but not too much (see the picture above). 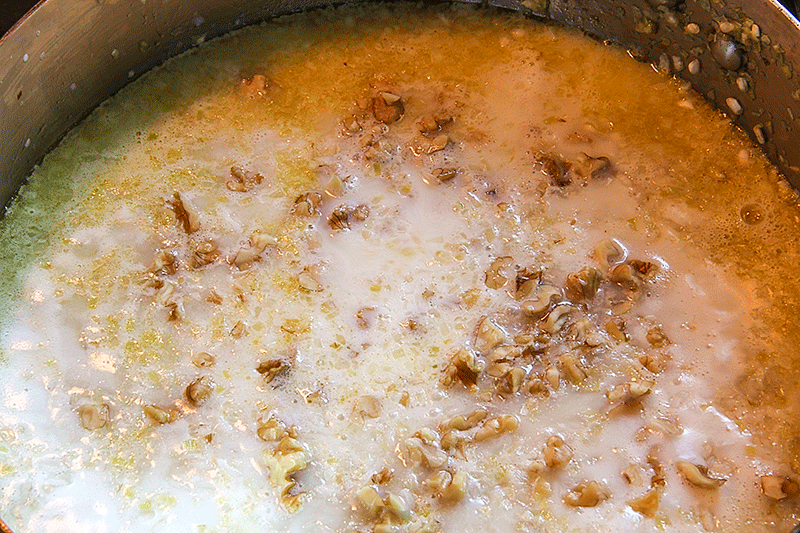 Grate the Provolone and heat 2 cups of milk in a second small pot, until it will be hot but not boiling. 7 minutes after adding the broth (which in the meantime will be almost completely dried), add a glass of the heat up milk, then mix gently and continue cooking for another 7-8 minutes. If the rice is going to be too much dry before reaching the ideal cooking, add more milk, a little at a time. When the rice is almost cooked, turn off the heat, add the provolone, and complete with ground black pepper. Stir the rice with energy, add salt if necessary, and cover the saucepan with a lid letting it rest a few minutes; Then serve immediately.